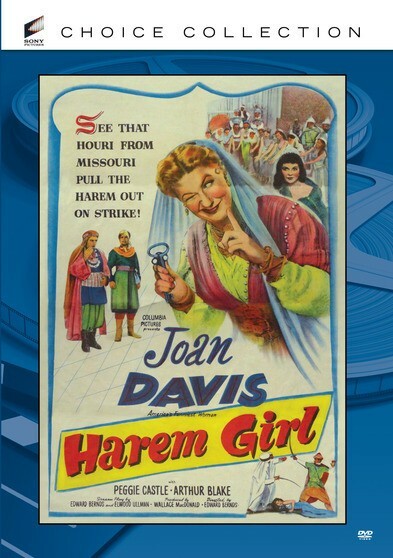 Susie Perkins (Joan Davis, Hold That Ghost) is a fast-talking, wisecracking girl from Cedar Rapids who moves to the Middle East in search of romance and adventure. Becoming a personal assistant to Princess Shareen (Peggie Castle, I, the Jury), the leader of a small Middle-Eastern country full of oil, Susie is asked to disguise herself as the princess, but she gets accidentally taken to a sheik’s palace in order to marry him. When Susie finds out that the princess is actually in trouble, it’s up to her to save the day! Newly remastered. Peggie Castle; Joan Davis; Paul Marion; Donald Randolph – 1952 – BW – 70 Minutes.